Celebrate the great things that VAB has done for the Art Dept. and the art students to date and get a start on the holiday social season. 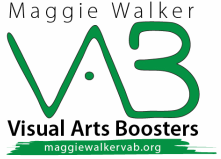 The auction is our big money-maker and the proceeds directly fund the many VAB programs, events, and contributions to the Art Dept. and its students ....Please consider donating an experience, dinner, trip, or vacation home (these are the items that get the highest bids). Contact our Auction Chair for more details. This is such a special exhibit! Each art student has something on display and the VAB provides a lovely spread of food and drinks to make the event complete. NEW FOR THIS YEAR - the Music Dept. is joining us in our celebration! We hope to make this an annual tradition! OK, by now we really need a party! Also, we will have met some new parents and it's nice to invite them into the group. ​This is the capstone event for the seniors in Art IV/V and it's a BIG DEAL! The VAB and junior parents always make this such a special event by organizing the food and drinks and allowing the senior parents and students to enjoy the night.